For free childcare, please register here. If necessary, please click on the images to register and pay. (Reminder: Money is never a reason not to attend, we have scholarships and funding available for anyone in need. Please let Kaisi Cunningham know if you need financial assistance with an event. Join us as we say 'farewell' to Rev. Jeff Powers and his wife Julie and say 'welcome' to Rev. Meredith Mills and her family. All games are at Memorial Park #1 at 6501 Memorial Dr, Houston, TX 77007 on Field #1. On Friday, April 19, join us in the Sanctuary 7 PM. This evening will be a special service on the Passion Story according to John. To Easter Sunday Services on April 21st. We have 3 services for you to enjoy with your family and friends. ​We invite you to come celebrate our Risen King! Fun for the Whole Family! Join us in between Easter Services on the Front Lawn for our Annual Easter Egg Hunt. This is a FREE Community event open to ALL! Enjoy FREE photos with the Easter Bunny, Egg Hunt and lite snacks. Hey Guys! It's your turn to Escape the Room again. This was a great hit last time. If you missed it, this is your turn to come and enjoy fellowship and fun with the Men of Westminster! Cost is $33/ person plus dinner if you wish to join. Meet at the General Public in City Centre by 6:30 pm! Register no late than April 18th, REGISTER HERE. Hey you youngsters... (Ages 19-35) We are beginning a special ministry JUST FOR YOU! Come together for fun, games and fellowship as we get to know those in our walk of life together! Come over to the Lopez's home on April 27th at 6:00 pm and bring $5 to help with cost. Or you can pay here. If you need Childcare we are happy to provide. Let us know! On April 28th, Youth will join the Director of Student Ministries Josh Rodrigue, for lunch and movie. Register online by April 18th online. Cost is $15 for the ticket. Meet here at the Church by 11:45 am. Lunch at Red Robin before going to Edwards marq'E. Movie starts at 1:50 pm. 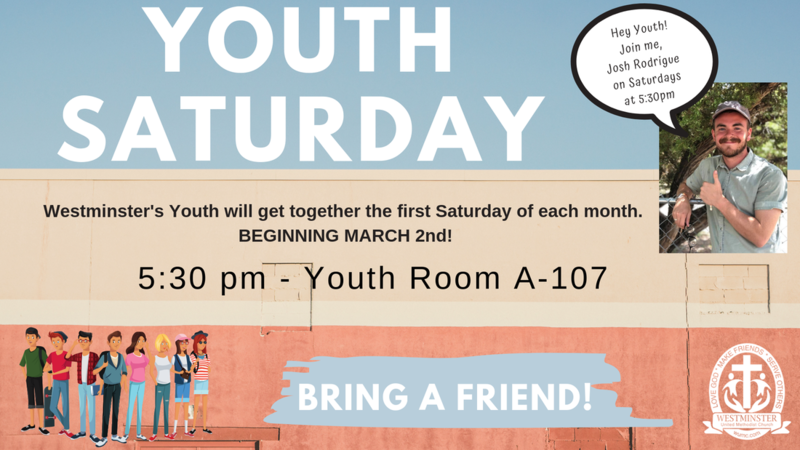 Join Josh Rodrigue and the Youth of Westminster on the 1st Saturday of each month. This is a special time to gather for fellowship, meeting new people, diving in the word and some fun! We have another fun event for the YAW (Young Adult's of Westminster) on May 18th at Escape the Room. Register online by May 12th online. Cost is $32/person plus dinner. Meet at 8th Wonder after the game. Summer is almost here! Can you believe it? This year Westminster will be hosting summer camps for kids of all ages. As well Triumph Sports hosting sports camps.